Mini Kumato® tomatoes are naturally grown in the best tomato fields of Europe by expert tomato growers which guarantees the highest quality and most all year round. 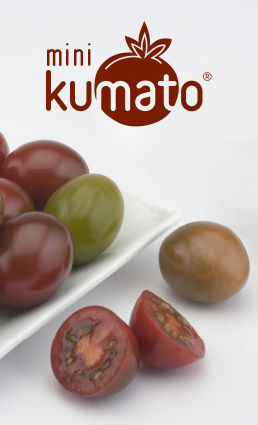 The new mini Kumato ® tomatoes are really delicious for their sweet and intense taste, combined with their special colour. Grown in Benelux and Spain. Ripened under optimum climatic conditions, to achieve the highest levels of fructose and the firmness that make these tomatoes for so many people their favourite salad ingredient. Selected specialist growers follow strict protocols and environmental-friendly crop management procedures to guarantee consistently high quality standards. Rigorous quality controls from the time the fruit is harvested, right through to the shelf at point of sale, allow us to select only the highest-quality fruits. All handling, packing, storage and transportation is performed in temperature-controlled hygienic areas and with methods compliant to the international rules for sanitation of facilities (Eurepgap/BRC/IFS).